Codec IC chips are used to encode and decode or compress and decompress various types of data, particularly when bulk storage is required. Codec is an abbreviation for coder-decoder or compressor/decompressor. The input voltage of amount 1.42 volt is fed to codec chips. The input signal in the form of assembly language is interpreted by the programmable logic of the codec chips in high-level language. The high-level language is understandable by the central processing unit of the codec IC chips and then it performs operations based on the input signals received by the central processing unit. There are many different types of codec chips. Examples include a WM8731 audio codec chip, ADV202 video codec chip, MP3 codec chip, and a WMV codec chip. A WM8731 audio codec chip is designed for use in portable digital audio sets. A WM8731 audio chip works on a software algorithm that requires less power and uses high quality audio codec integration. A user can download audio codec logic and implement it in the circuit. An ADV202 video codec chip is used in applications that require high-quality and image compressed video. An MP3 codec chip is also commonly known as QuickTime video codecs. An MP3 codec chip or QuickTime video codecs are designed specifically for use in a high-level of integration and performance in speech and audio applications. A WMV codec chip is abbreviated for Windows Media and is an audio codec chip. A WMV codec chip can be used interchangeably either as an audio or video chip. Other codec chips are also commonly available. How do Codec ICs Work? There are several ways in which codec chips function. Codec IC chips work by receiving signals in the form of assembly language and then interpreting it into high-level language. The operations are then performed on the basis of received input signals. A WM8731 audio codec chip requires resistance power ranging from 50mW on 16Ohms and supply voltage of range from 1.42 to 3.6 volts. A WM8731 audio codec chip also requires a sampling frequency ranging from 8 to 96 KHz. An ADV202 video codec chip operates in the temperature range of -40 to 85 ºC and requires a 2.5 to 3.3 volt of power supply. An MP3 codec chip uses 4K * 20bit program code. The flash memory of an MP3 codec chip requires 2.7 to 3.3 volts supply for its operation. A WMV codec chip requires an operating voltage of 2.5 volts and power of 40mW. Codec chips are designed and manufactured to meet most industry specifications. How are Codec ICs Used? 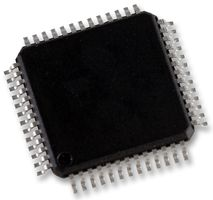 Codec IC chips are used in many applications. Codec IC chips are used in personal computers and home theaters. In addition, codec chips are also used in the movie industry, consumer audio sets, and automobiles. The H.323 standard standardized the transfer of conferencing data on a network. Codec IC chips should adhere to the H.323 standard.